Powroźnik is a village situated in the valley of Muszynka, on the railway line Muszyna-Krynica. It’s name indicates the auxiliary function and is derived from ropes produced here in the past. The first mention of this historic village comes from the act of donation issued by King Wladyslaw Jagiello in 1391, however the act of location was issued 23 March 1565, at the Parliamentary meeting in Piotrków. In 1637 the Greek Catholic parish was founded in Powroźnik. There was a glass factory there, then. Originally it produced glass windows for the castle in Muszyna, but in the end of the eighteenth century the factory had completely disappeared. Similar mills were also in Muszyna and Słotwiny. Powroźnik was a Lemko village. In 1940 about 100 Lemkos from Powroźnik emigrated to Ukraine, under the pressure from the Germans. Then, during the “Wisla” operation in 1947, the remaining 451 Lemkos were removed from Powroźnik. Soon theirs’ land and villages were filled with Polish settlers moved here from eastern Poland ( the part of Poland which was taken by the Soviet Union and never returned but which was inhabited in a great majority by Polish, and which was a part of Poland before WWII). In Powroźnik there are many monuments of secular Lemko culture, such as wooden barns, brick cellar and houses. But undoubtedly the most precious historic building in this area is the church of St. James the Apostle. It was built in 1606, but in a different place than it is today - after a flood it has been transferred and partially rebuilt. The temple is entirely wooden, trigeminal. The construction of a typical for Lemko architecture. Wooden building with the 18-meter high tower, pole construction. Pavilion roof covers the nave, while the choir is covered with three –side roof. The church has three towers with onion domes and blind lanterns. The walls and roof covered with shingles. Inside, there are many valuable relics of an orthodox art. Attention attracts a beautiful figural polychrome, the Baroque altar with an icon of Our Lady and Child from the early seventeenth century. The seventeenth-century iconostasis is now behind the altar. It contains unique images, (such as "Last Judgement", "Aron", "Piet") preserved by experts in Krakow. The oldest church furnishings are a rococo pulpit from 1700, and a bell made in 1615 and located in the tower. The temple is surrounded by a stone wall with a shingled roof. Since 1951, the church functions as a Roman Catholic church under the old title. 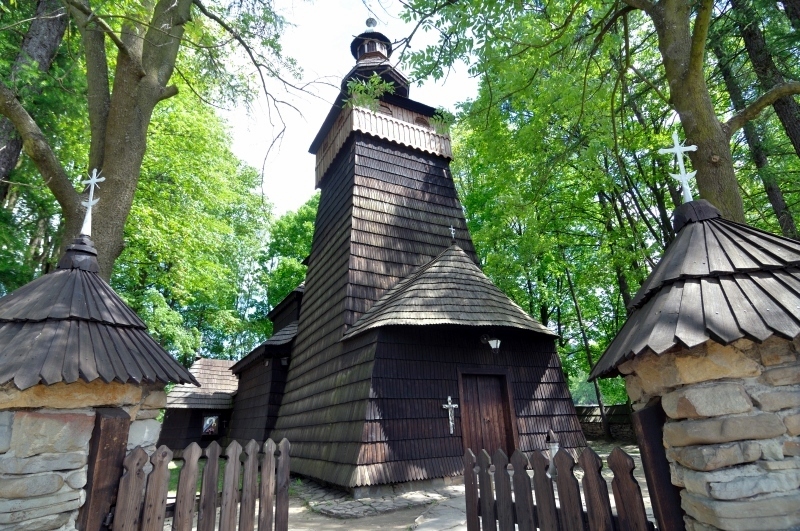 This is one of the best preserved examples of orthodox church construction in Poland. Church, including valuable vestry, is available to the visitors immediately after Sunday services. There is a large number of mineral water sources located near Powroźnik. They occur in the valley of Muszynka and on the southern slopes of Bradowiec. Among them are the ferruginous water containing carbon dioxide. The village is situated at an altitude of about 480 m. There are two routes which begins in Powroźnik: in Parkowa Mountain’s direction (about two hours.) And the other to Zimne Mountain and then towards Leluchów (three hours of walking). 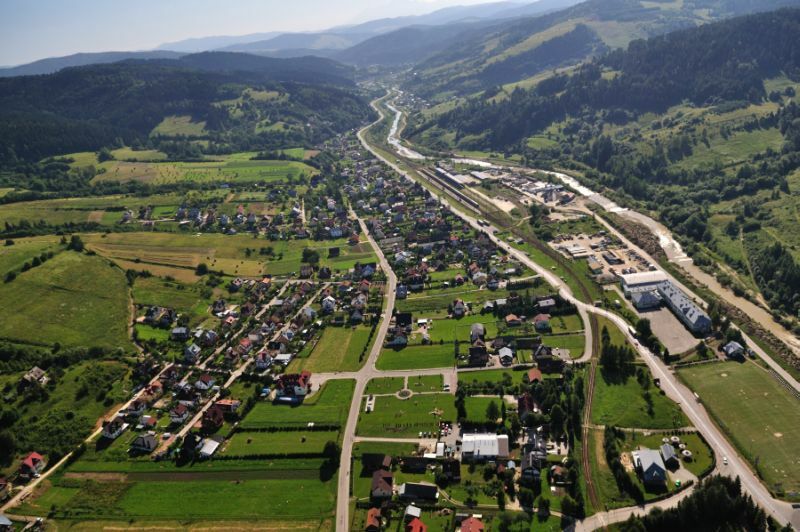 In the village there is a train station, ski lifts, and a modern sewage treatment plant for Krynica Zdrój.